Situated along the border of California and Nevada, Lake Tahoe is the largest alpine lake in North America, trailing only the Great Lakes in terms of size. This helps to make the Tahoe region one of the best outdoor playgrounds in the U.S., giving adventure travelers plenty of opportunities to take part in some truly memorable experiences. If you're planning on visiting the area, and you're wondering what you should do while you're there, we have some suggestions that will keep even the most active travelers busy. The Desolation Wilderness is a remote stretch of backcountry that covers nearly 64,000 acres that overlook Lake Tahoe itself. It is a place where solitude and natural beauty come together to create a truly unique landscape filled with towering peaks, thick forests, and a series of alpine lakes that are each more breathtaking than the last. A network of trails criss-cross the area, providing hikers and backpackers with plenty of routes to explore. Most visitors spend just a few hours walking in the forest, but to truly get a sense of the place, head deeper into the wilderness for a few days and go camping in a setting that remains virtually untouched by man. 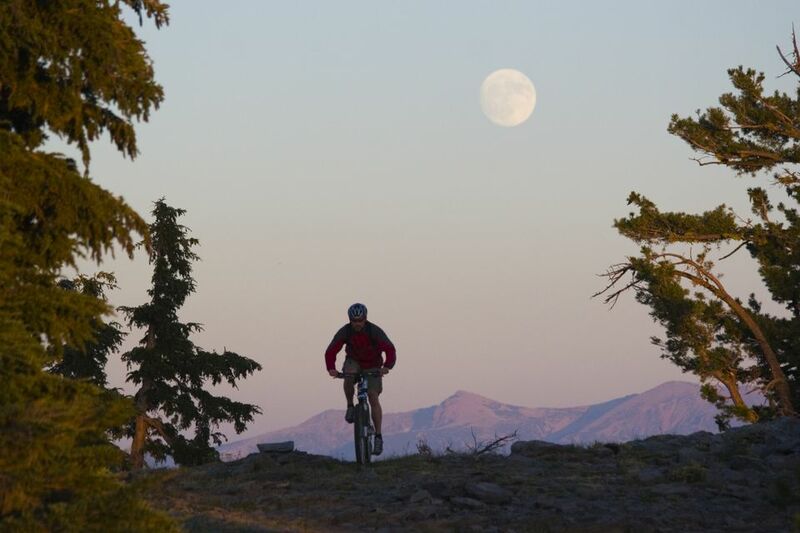 Considering the amount of amazing wilderness that surrounds Lake Tahoe, it should come as no surprise that there are many mountain bike trails to be explored. The best of these is probably the Tahoe Rim Trail, which stretches for more than 165 miles along the Tahoe basin itself. But, that is a massive undertaking for most riders, so for something a bit more manageable, hit the Flume Trail instead. It is exceptionally beautiful, offers some great riding, and is beginner friendly. The 14-mile ride provides a nice glimpse of what the region has to offer, while only requiring a few hours of your time. The Tahoe Rim Trail isn't just for mountain biking. It is an excellent place to go hiking and trail running too. In fact, while much of the route is open to bikers, there are even more options for trail runners to explore, including points where the Rim Trail meets the Pacific Crest Trail to create an spectacularly beautiful and impressively large greater trail system. Each year, there are a number of trail races of varying lengths held throughout the Tahoe area. Whether you're just looking for a 5k to get your blood pumping or you want to compete in a half-, full-, or ultra-marathon, you'll find something to your liking. And of course, the hundreds of miles of trail that are available make for a great training ground for any outdoor athlete. With its miles of shoreline, hidden coves, and beautiful inlets, Lake Tahoe is a fantastic place to go stand-up paddleboarding. It is also a great spot to pick up the sport for the first time, as the lake tends to be beginner friendly for those who are new to SUP. Tahoe's crystal-clear waters make for a picturesque backdrop for any paddleboarding excursion, which is always a great workout and a wonderful way to explore any river or lake. Whether you want to take a SUP class, paddle the lake yourself, or go on a guided tour, the Tahoe Adventure Company can help get you started. Located on the California side of the water, TAC will not only organize your SUP outing, but can offer mountain biking tours, rock climbing excursions, hiking tips, and other experiences in and around Tahoe. As you can imagine with a lake of this size, Tahoe has some excellent opportunities for paddlers looking to explore its pristine waters by kayak or canoe. But perhaps the most scenic of all of these trips is the paddle from D.L. Bliss State Park to Emerald Bay, covering about six miles of Tahoe shoreline. During this excursion kayakers glide past towering granite spires and thick woods, while discovering numerous smaller coves hidden along the shore. They'll also have the opportunity to spot a variety of wildlife, including bald eagles, deer, and even the occasional fish that springs from the water. It is a sublime way to get a look at the Tahoe region far from the crowded beaches and busy hiking trails. For those who want a concentrated dose of adventure, head over to Heavenly Mountain Resort and buy the Ultimate Adventure Pass. This gives visitors access not only to the scenic gondola ride to the top of the mountain, but it allows them to take on several different ropes courses, climb the Granite Peak climbing wall, ride the resort's multiple zip lines, and go tubing too. In short, it is an all-access pass to an amazing array of outdoor adventures that will lead to one busy and active day that you won't soon forget. Of course, Heavenly is one of the premiere ski resorts in North America too, making Tahoe a great winter destination for adventure travelers. The lodge offers 97 named run and features 30 lifts to whisk skiers and snowboarders to the top of the hill. It also averages about 360 inches of snow each year, ensuring that there is always plenty of fresh powder to shred. There are even two terrain parks for those who want to have a go at the jumps, boxes, and pipes set up there. For those looking for a beautiful backdrop to their skiing adventures, this is a top-notch location to have on your radar. Skiing isn't the only opportunity for winter adventure in the Tahoe area, as snowshoeing is a wonderful way to explore the backcountry as well. Many of the trails used for hiking and backpacking are also accessible during the winter, but one of the best routes is the Echo Lakes Trail, which is scenic and relatively flat. For those looking for more of a challenging hike – and true backcountry adventure – give the Mt. Tallac trail a go. It rises 3000 feet over a 2.5 mile stretch, making it a tremendous winter workout for any outdoor athlete.